Gina Freehill | Wedding Cake Topper "Kiss"
Wedding Cake Topper 9"H, Weight 1 lb-2oz., Resin and Stone mix, rhinestones, fabric tulle veil. 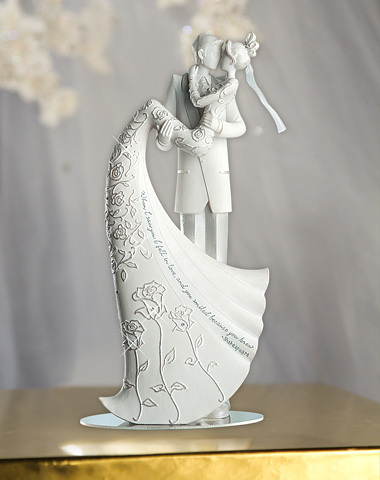 Oval Base - 2.75" x 4.25"
The 'Kiss' Wedding Cake Topper is also a stand-alone collectible and as an added value to customers, the collectible size 'Language of Love' Cake Toppers purchased here are hand signed by Gina Freehill. If you are looking for an artful, unique cake topper that is modern and elegant the Kiss topper will stand out on your wedding cake!